The time has come to modernize your conference room. Don't let your business fall behind the industry curve and fail to impress your valued visitors. With the help of Global, you can take your meeting area to the next level. This reputable office furniture manufacturer has made it their mission to craft the coolest conference tables on the market. Today in our 'Fall Finds' series we'll take a look at a few of their hottest options on the scene this season. The professional conference room furniture from Global available this season is second to none. Take one look at the all new modern tables from their Kadin collection and you'll quickly see why. These floating top tables with polished metal legs are a sight for sore eyes in a world filled with overly similar table styles that lack character. You'll also want to check out the tables from the Global Alba collection this Fall. They're affordable, versatile, and super stylish. Alba tables are available in oval, rectangular, and elliptical variations designed to maximize square footage, seating potential and appeal. Popular models like the GR6STM are available starting at just $497.99 and include free nationwide shipping. 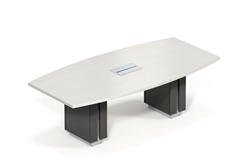 The powered office furniture trend is here to stay and the tables from the Global Zira series are a big reason why. For years, powered furniture was consider to be a fad and an overpriced luxury that just wasn't practical for the average business. Thankfully, Global raised the bar. Their Zira series conference room tables with USB and HDMI inputs are completely customizable, easy to spec, and surprisingly affordable. Go modern with modular office furniture for the conference room this Fall. Global Bungee series tables unrivaled versatility. With a Bungee table set, the possibilities are truly endless. You can use a singular space for both conference and training activities. Bungee sets are available in a variety of size and finish combinations that you'll absolutely love for your multi purpose work environments. 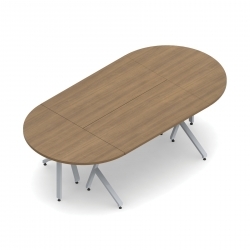 Last but certainly not least, you can modernize your conference and training environments on a budget with the connectable collaboration tables from the Global Junction Series. This line of user friendly and surprisingly cost effective components make it easy to think outside the box. You can effectively use Junction tables to create oval, V shaped, and other unique table layouts that encourage team interaction. If you're looking for ways to get the creative juices flowing in the conference room, Junction tables are ready, willing, and able to help.